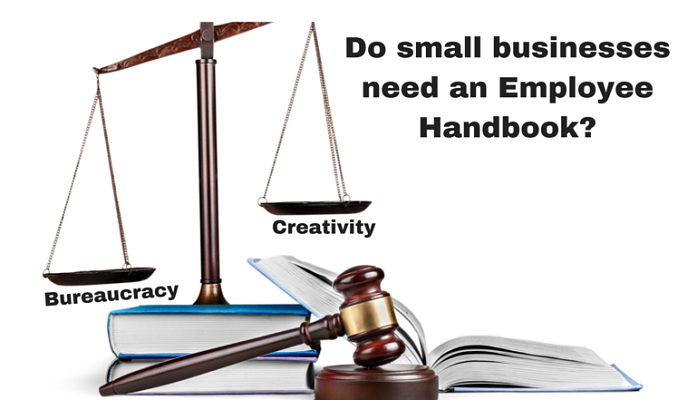 An employee handbook is not required by law, but they are a “must-have” regardless of the size of your business. I know when I started my HR small business one of our biggest challenges was trying to keep everyone aligned with the company’s vision. We also wanted to make sure we had all the policies in place to be compliant with all the relevant employment laws. I’m sure many small businesses struggle with these challenges. We needed our employee handbook to be the bridge between our vision and the day-to-day operations. Something that could describe our culture, set expectations for everyone, and answer the most command HR questions. But, we didn’t want a boring old traditional employee handbook. Even though certain policies are mandatory by law, it doesn’t mean they have to be written in legalese language. We see this type of wording all the time in the old-school employee handbooks. But, there is a better way, in Part 2 of this series of entitled Do Employee Handbooks Have to be Boring? we delve into this problem in greater detail. Handbooks are not just about protecting your … assets … in the event of potential legal action. More importantly, they are a guide that sets out in clear positive language, what you expect from your employees and what they can expect from you. The best place to start when creating an employee handbook is determining which policies make sense for your business (plus, the legally required ones). The last thing you want is to drown your employees and managers with a bunch of bureaucracy. Too many rules tend to scare people and then creativity suffers. Which policies are legally required? Each province has legislation for Health and Safety in the workplace. For example, in Ontario, the Occupational Health and Safety Act requires employers with six or more workers to have a written policy. In 2010, Ontario Health and Safety Act, Bill 168 Anti-Bullying legislation was passed making it compulsory for all workplaces to have these policies in place. Employment contracts and policies must conform to human rights legislation (such as Ontario Human Rights Code). Harassment policies are required in all workplaces. The Accessibility for Ontarians with Disabilities Act (AODA) and Integrated Accessibility Standards apply to both private and non-profit sectors. Under the AODA there are specific training requirements (including Human Rights), policies and accommodations that employers are required to have in place, these are being phased in between 2013 and 2021. Privacy and Human Rights policies not mandatory but most experts say it’s advisable to include these in your handbooks. The location of where your employee work will determine the appropriate provincial employments laws that apply to your business. Policies, training, and other requirements are also different for each jurisdiction and require further research for your specific business. Which policies should you have in an employee handbook? Overtime Policy Distinguishing who is eligible, at what rate and how the approval process works is essential when dealing with overtime pay. TIP: Keep in mind, overtime policies must follow the employment standards legislation in your province. Attendance Policy Establishing clear schedules of when an employee is expected to be at work is vital to running an efficient operation. Make sure your handbook defines the difference between absences that are “culpable” (within the employee’s control) and “non-culpable” (not within the employee’s control). TIP: Human rights laws may consider some non-culpable absences as a “disability” and would require accommodation by the employer. Computer, Internet and Social Networking Policies A computer use and social networking policies are important in today’s workplace. Company property should be defined and that you have the right to monitor usage. Plus, all employee personal social media communications should contain a disclaimer that they are expressing their opinions not the company’s opinions. TIP: Computer usage policy should comply with Canada’s Anti-Spam Legislation (CASL). Substance Abuse Policy Organizations need to have a policy in place regarding intoxication in the workplace. Especially for workplaces that have high safety issues, this policy becomes essential. This policy needs to clearly define “substances” (e.g. alcohol, drugs, and prescribed medication which cause impairment). TIP: Human rights laws, privacy and other laws need to be taken into consideration if you intend to include wording about random testing and disciplinary actions. Conflict of Interest Policy Employers have the right to expect their employees to be loyal and act in the company’s best interest. TIP: Add examples of situations that could be considered a conflict between the employee’s personal interest and the best interest of the company may happen. Progressive Discipline Policy Describe the escalating steps that may be taken if there is a violation of certain policies or in there is a performance issue. A progressive discipline process gives the employee the chance to improve their behaviour or conduct before resorting to a final step of termination. TIP: Administering this policy fairly and consistently is the key. Termination Notice Policy Provincial employment standards mandate the minimum termination notice and pay lieu of notice. TIP: A termination policy accompanied with the progressive discipline process helps to protect your business against wrongful dismissal complaints. These policies make up the core components of an effective employee handbook. We know how challenging it is to run a small business and find the time to create and maintain a handbook. But, the investment is worth it when you see the value it will bring to your business. Whether you’re trying to attract investors or great employees, a handbook instantly increases your credibility and professional image. QUESTION: Are you ready to create or update your employee handbook? 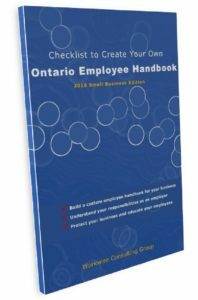 Here is a FREE Ontario Employee Handbook Checklist to walk you through the process.